In my attempt to get back into my underground campaign world I’ve created the Burrow of Linmead. 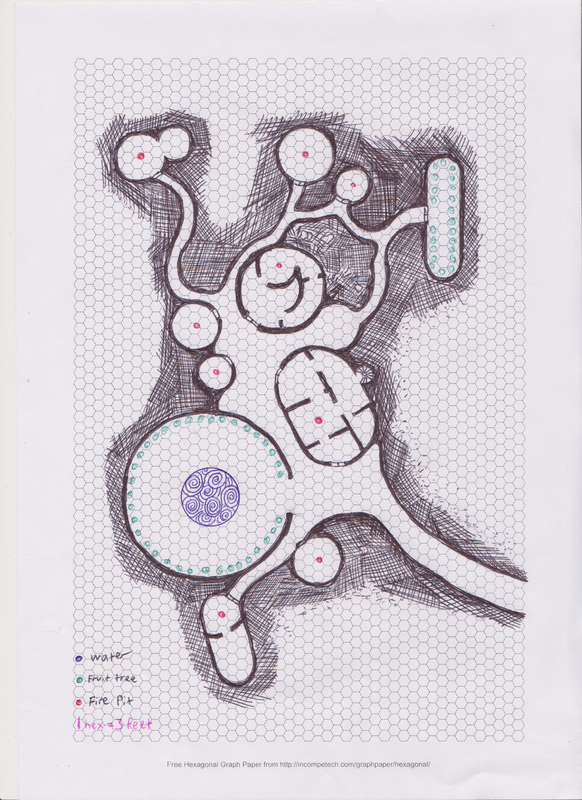 See About my Dungeon World for a description of my Dungeon Fantasy setting. Sanitation: None, chamber pots are collected. Urine goes into barrels which are sold off, feces is turned into fertilizer. Trade: Mead, Cider, and water are the main exports. Import fuel, basic food stuffs, clothing, etc. Linmead is a very special Burrow as it has it’s own clean water source, it has only one entrance so it is defensible. However more importantly they have their own gardens for growing food and they have their own pocket dimension which they use to produce honey for the Linmead Meadery. The Linmead pocket dimension is an impressive 315 acres of clover and wild flowers and 250 Apple Trees which they also make Cider from. There is one round house within the pocket dimension which is used by the caretaker of the grounds. The L.P.D. (Linmead Pocket Dimension) has four seasons that are just perfect for growing apples. The bees produce a good quantity of honey and have no predators. The Laughing Bee Inn is rarely less than half full as they do steady trade in Cider, Mead, and water. Most of the buildings resemble Iron Age round houses on the inside. Some will have ladders to upper or lower levels, every house has a fire pit in the center. Linmead also has a mushroom farm. The water comes from one pool in the Burrows communal area. It is a very large domed room lit with lanterns with the pool in the center and bioluminescence vegetable and fruit plants in large clay pots around the edges. The Orchard has been invaded by a Awd Goggie (a type of Bogie who haunts forests and orchards, and kidnaps children). The adventurers have been contracted to remove the Fae without damaging the Orchard or the Hives. A group of Bandits have set up a blockade against Linmead Burrow and a conglomerate of Inn Keepers and Merchants have offered a bounty for the capture of the ring leader(s), the rest are wanted dead or alive. All is not as it seems in friendly Linmead. You have been hired to track down a missing couple of newlyweds who have disappeared. Your investigations lead you to Linmead where the couple will be sacrificed to a Harvest Spirit. Can you save them in time? The characters have been sent to Linmead to retrieve an ancient artifact, however the local Druid uses the artifact to perform Harvest rituals. Without the artifact they will be required to perform sacrifice during the ritual.